The most graceful fitted bedroom design we've ever produced. A classic look and update it with more contemporary colours. A fantastically fresh edge fitted bedroom. Our bespoke bedroom design that provides the perfect place to unwind. The light beech wood finish is warm and inviting. A gloss finished fitted bedroom for those who love colourful designs. Inspire a calming muted scheme throughout the fitted bedroom. A popular pick from the Heritage palette. Tactile wood grain finish and delightfully designed handles. 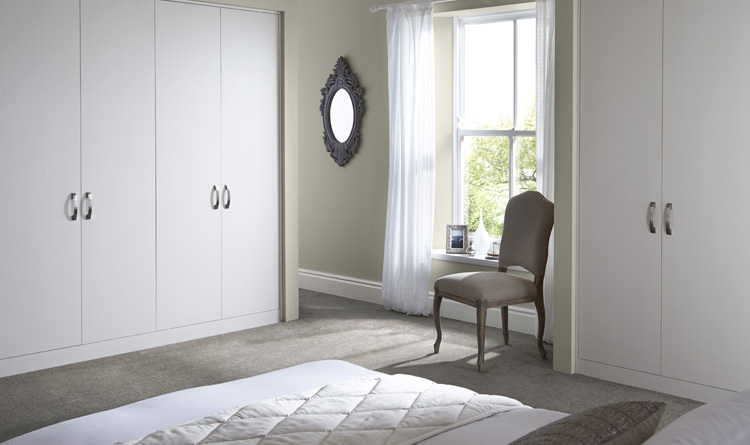 A white bedroom design that boasts serenity with a walk in wardrobe. Transform your loft with this quality purpose built fitted bedroom. A purpose built play room in our qualiy, widely popular range. Say "hello" to vogue with this stunning bedroom design. The most luxurious lustre to its finish. A glass design that utilises natural light to lighten your bedroom. Make your bedroom a place of tranquillity with this smooth design. Use natural light and mirrors to make this bedroom sparkle. A classic Italian fitted bedroom design that exudes quality. Let natural light emphasise your bedroom with our trendy design. A smart fitted bedroom with features highlighted by a bold black trim. Two varying colours combine to complete this fitted bedroom. A luxury bedroom design made special with modern, warm lighting. An elegant & inviting bedroom, completed by a sliding wardrobe design. Highlighted your fitted bedroom with this bold black & white design. Use pink & white sliding doors to highlight the space in your bedroom. The light, bright and airy feel of the painted timber. Red juxtaposed with black to give a stunning bedroom design. There are big bedrooms, small bedrooms, guest bedrooms and master bedrooms. And here at Betta Living we’ve a design to fit them all. Our range of fitted bedrooms has something to suit every style and budget so sleep easy that we’ll help to choose the right one for you. Whatever your plans, check out what we can offer and let us find a fitted bedroom that fits in with them perfectly. Many believe us to be Britain's favourite for fitted bedrooms - why not see if you agree.